A brother of the Shogun, the evil and sadistic Lord Naritsugu is above the law and commits a string of brutal atrocities across the length and breadth of a feudal Japan. 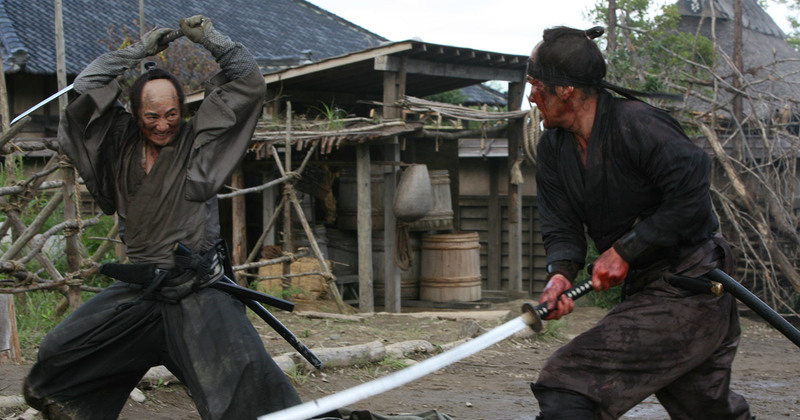 Shinzaemon Shmada and his team of fellow samurai are hired to assassinate him, resulting in a final gruesome showdown. The prolific director of over 80 films, Takashi Miike, will not disappoint his legions of fans with his latest bloodfest. Best known in the West for films such as ‘Audition’ and ‘Dead or Alive’, the film master has also dabbled in period dramas, melodramas and even children’s films. His expert hands have now remade 13 Assassins, first produced in 1963. While there is blood and violence aplenty, Miike never delivers this is an exploitative way. Much of the violence is left to the imagination as it takes place off screen, and the viewer is treated to outstanding sound effects which will make the hair in the back of your neck stand to attention. This starts right at the beginning of a film with a Hara-kiri incident that makes you shudder. 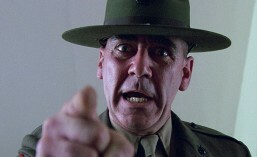 Violence is used skilfully in this film, to illustrate a character and to grab the viewer’s attention. The former is employed in the very act of 13 Assassins, when Lord Naritsugu sadistically massacres entire families, and relieves a young peasant girl of her tongue and limbs. This succeeds spectacularly in conveying how sick and depraved Naritsugu really is, and you are praying for his demise. The first two acts of the film are very enjoyable, but you sense the tension building and find yourself wishing you could fast forward to the third act. Here, Miike’s masterful direction of fight scenes comes into its own. The incredible violence is played out almost balletically. The grace in which the violence is portrayed is nothing short of mind blowing. The swordplay, in particular, is almost poetic in its execution. The choreography of the fight scenes are grittily realistic, there is no flying through the air or any wirework of any kind. The most far-fetched action you get in this film is the characters jumping from rooftops and landing easily on the ground. It is easy to forgive Miike for his moment of over-exuberance however, as these are samurai warriors at the end of the day. It only takes one slash to kill someone in this film, none of this nonsense where they are stabbed 75 times and keep coming back for more. The one exception is a wild mountain man named Koyata. He is stabbed through the neck but pops up in the next scene, much to the shock of the character who thought he’d killed him. The samurai asks him if he is immortal, which gives the film a comedy moment that doesn’t detract from the realism. 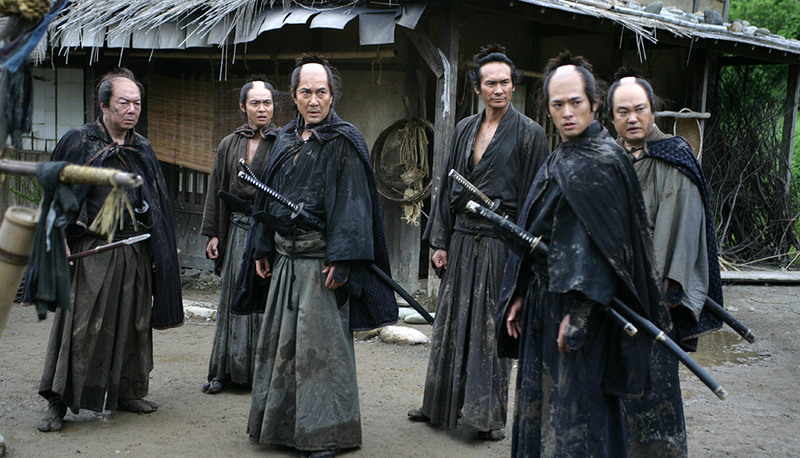 The outstanding cinematography of 13 Assassins can not go by without a mention. Nobuyasu Kita utilises the wide-angle shots in two contrasting ways that come together sublimely. 13 Assassins is an outstanding piece of film making. The plot and the visuals combine to make one of the most incredible cinematic experiences of recent times. This entry was posted in Movie Review, Movie Trailer and tagged 13 Assassins, 13 Assassins review, 13 Assassins trailer. Bookmark the permalink. Agreed. 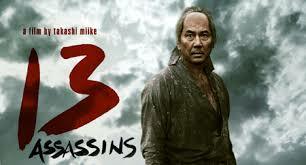 13 Assassins is excellent. Takashi Miike tends to make fantastically crazy movies, but here he proves that he could also make a great straightforward action pic. I think I saw this a few years ago. The finale was great.